In the summer of 2000, I dove headlong into my post as a self-contained 4th-grade bilingual teacher. Naively, I thought — like a latter-day Don Quixote — that I was capable of much more than I was. My quixotic expectations quickly subsided as the reality of the day-to-day challenges of teaching set in. I learned, for example, that reteaching did not mean saying it louder; that different students had different learning styles; and I learned, in time, that I didn’t know it all. But the biggest revelation was also the most humbling. Teaching was never about me; it was about the students. That’s right. I wasn’t the hero I thought I was. The kids were. 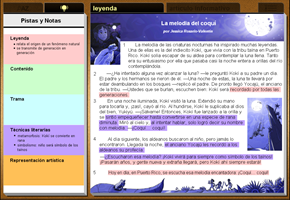 This idea played a key role in the development of Istation Español’s World of Genres, which is an intervention solution that places students at the forefront of their own learning. 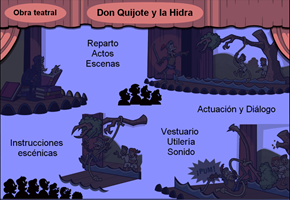 In the Land of the Past, which is the first of the World of Genres’ three-part journey, Don Quixote and Sancho Panza guide students on their genre-learning adventure. The student heroes earn coins and stars throughout their journey, which they exchange for virtual rewards once they’ve completed a lesson. And speaking of lessons . . . The World of Genres’ lessons follow a gradual release model and feature two genres per lesson: one fiction and one nonfiction. Each lesson focuses on a specific skill, such as identifying the themes of texts (family, perseverance, and justice, to name a few), or exploring the main character or historical figure of a passage. The teaching begins with a “visual hook,” which is comprised of a pair of images that helps children make sense of the main skill. In the Land of the Past, the visual hooks include illustrations, maps, and comic strips to motivate and engage students. 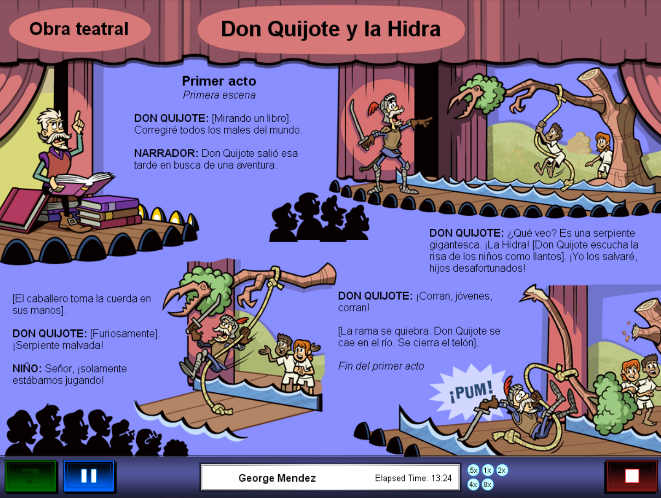 This "visual hook" uses a comic strip to teach students character analysis. An interactive guided practice follows, allowing kids to delve deeper into the concept via two short passages that incorporate the genre characteristics they’re exploring. To bolster their understanding, students are tasked with comparing the genres using interactive T-charts and Venn diagrams. After the self-paced guided practice, kids get to show what they’ve learned in the independent practice phase of the lesson. A reteach path is even provided, and no, we don’t use the “say it louder” method. Here you can see short passages, a legend and an informative article. Students can click any of the concepts in the color-coded fields to the left to reveal the specific text in the passage that reflects that particular concept. Rounding out the features of our program are vocabulary matching games with Tier 2 words*, a digital dictionary, guiding tips, and an intuitive tab navigation interface, all of which give the World of Genres an exploratory vibe that makes learning to read fun and seamless. 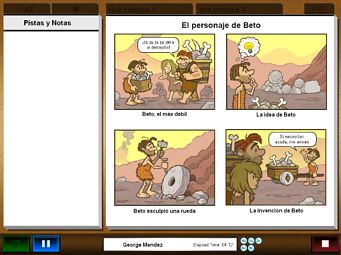 Along with the games and digital dictionary, Istation Español presents its unique genre exploratory scenes. Like the guided practice selections above, this experience is self-paced. Students may click any of the genre characteristics (left photo) and so unveil the story (right photo). 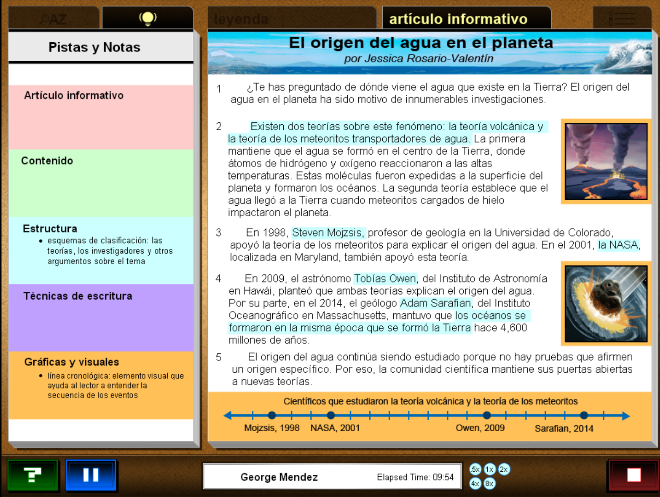 Animations and sound effects help to cement the concepts in the student user's mind. 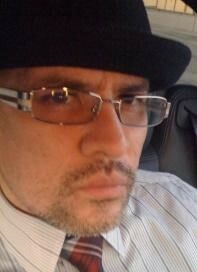 The Land of the Past’s scope and breadth are intended to extend beyond the digital realm. The idea is that once students have traversed this magical space, they will be better equipped as independent readers. Ultimately, the bilingual classroom reinforces what is learned in the World of Genres and vice versa. As creators of their own learning, students forge their path in a hero’s tale that is truly never-ending. 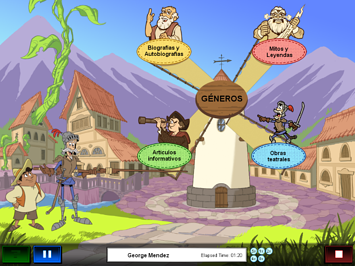 And this makes Istation Español’s World of Genres a Spanish literacy solution for the books! Stay tuned over the next few weeks to continue learning about each land in “The World of Genres” in Istation Español. *These are important words for kids to know because they can be used in a variety of disciplines and contexts. Istation is an award-winning comprehensive e-learning program used by more than four million students across the world. Known for its accurate assessments, engaging curriculum and trusted teacher tools, Istation helps students in prekindergarten–12th grade achieve academic growth.